For planirovochnyh works it is necessary to have some various inconsistent wooden rulers. To make them it is necessary from well dried up reek and laths. The adaptation facilitating crops of vegetable and flower seeds (we name its landing ruler), is the direct thin lath which length is equal to width of a bed, the height to 80 mm, and one side is pointed. Bending a ruler across a bed the pointed side, it is possible easily and to do quickly a superficial trench in which sow seeds. Thus the trench basis is slightly condensed that is obligatory, for example, at crops of small seeds of carrots, the parsley, some flower plants. On the ends of a landing ruler it is possible to beat four rectangular brusochka, on two on everyone a layer, for them it is convenient to keep a ruler in the necessary position. For a ridge marking under landing of sprouts, strawberry moustaches, large seeds bean conveniently other adaptation. It is a wooden equal lath of the same sizes, as well as a ruler. On its ends two pointed rectangular pegs in height of 80-100 mm are beaten. Between them through certain intervals beat two-five more same pegs, distances between them depend on conditions of landings. These pegs can be attached to a lath by means of metal collars with screws. Then pegs will be mobile that will allow to mark and do lunki for landings of different cultures. On a lath superficial cross-section prosaws or an oil paint it is possible to put centimetric divisions. For many joiner's and planirovochnyh works it is more convenient to use not collapsible wooden metre or a roulette, and measured rejkoj in the length 1,5Рј. It is optimum length. Metre rulers are ready, wooden and metal. At length of a ruler more 1,5Рј it is more difficult to prevent it koroblenie. Difficultly, but it is possible. Purely planed from four parties a double plane=a ruler even curved from drying, it is possible to straighten, having pasted over its edge (convex) one layer of thin plywood. At drying gluing a ruler it will be curved in the opposite direction and it will be straightened. .
Planirovochnuju should be grounded a ruler liquid whitewash, then to mark: on one side on three half-metre parts, on other side - on the ten-centimetric. On the ends each decimeter can be marked centimetric divisions. That the marking was well visible and long remained, it is possible to make superficial prosaws nozhovochnym a cloth, cuts a chisel, to fill carnations with a wide hat. It is possible to cover a ruler, the second layer of an oil paint at least two different, but equally bright colours: one for a side with a large marking, another - for small. And heads of nails also it is possible to allocate cuts with a paint. 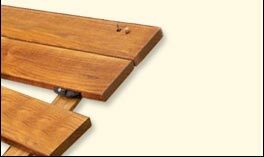 At end faces hammer two furniture nailing, they will protect end faces from mechanical damages and rotting.